A mattress can be quite the investment for your bedroom, with most beds costing hundreds or even thousands of dollars. Being such a large expense, it’s easy to see why you’d want to keep this in your bedroom for as long as possible. However, over time your mattress can begin to show signs of wear and tear. While you can cover up those that are visible, those that you can feel are another story. Sagging, in particular, can be difficult to overcome and make you want to throw your mattress out. Fortunately, that’s not necessarily the only solution! If you have some plywood, you can remedy this issue quickly and without a lot of effort. If you’re ready to learn how to fix a sagging mattress with plywood, then the steps below can help. They’re laid out to make it easy to do this project on your own. Once finished, you’ll no longer have that bothersome sagging in the middle of the bed so you can enjoy sleeping restfully once again. The first step is to go to your local home improvement store and buy a piece of plywood to place underneath your mattress. This should be wide enough to cover the area that sags and long enough to stretch from top to bottom of the bed. Most stores will custom cut a large piece of plywood for you. However, if you have a saw at home, then you can cut to your own dimensions as is needed. Keep in mind that plywood can be rough. If you want to avoid running into issues when you haul this under your mattress, then you may want to sand it down before handling. Fortunately, this is easy with a sanding block and a little bit of elbow grease. Remove your mattress from the bed until you just have the base or the slats exposed. After this, place the plywood on top until it’s in the area where your mattress sag would be. It might help to measure where the sagging starts and stops in order to make sure you have it positioned in the right area. This can save you time and energy, so it’s worthwhile to do. Once the plywood is lying down, the mattress can go on top just like it would your slats or bed frame. No is the time to lie on top of the bed to see how it feels. You should experience a noticeable difference. 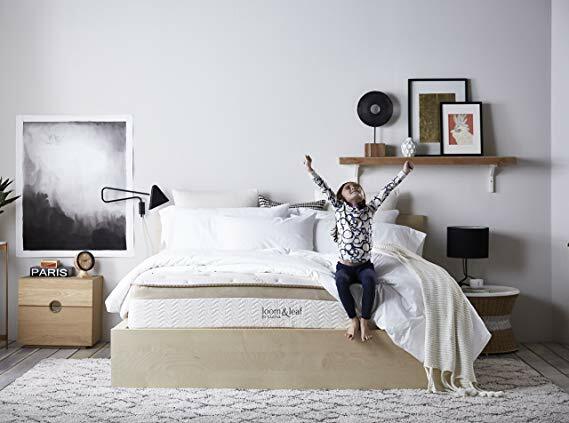 If your mattress still feels like it’s sagging in the middle, then you might want to double up on the plywood in order to even how the surface of the bed. To do this, simply repeat the steps above until you have something that feels comfortable to you. – Add a mattress pad to the top of your bed to help even things out and add a layer of softness to your bed. This can help negate the negative effects of plywood and make the bed more comfortable overall. – Periodically check the plywood for mold and mildew, as this material won’t be able to breathe when it’s put into position. – While plywood is an effective remedy for a sagging mattress, keep in mind that it’s only temporary. Eventually, an old mattress will need to be replaced. However, this can help for months or even up to a year until you are ready to invest in a new bed. Yes! Sagging in the middle of the bed is completely normal, especially for mattresses that are quite old. If this is happening to you, it’s nothing to sweat. Simply get your supplies, take an afternoon off, and then you’ll have a bed that’s like new. You’ll save a lot of money by using this quick fix. There’s no reason to deal with being uncomfortable on your bed just because of sagging. If you can find a piece of plywood or even scrap wood, you have all you need to remedy this issue. It only takes a few minutes to put it in place, and because it’s cheap, you won’t be breaking your budget. With that being said, why not fix your bed today?